As we zigzagged and rattled our way down the runway at Southampton I looked around at my fellow passengers and wondered if they were feeling the same sense of apprehension I was. There were only 10 of us on the flight and that meant we were almost at capacity. The curtain into the cockpit was held aside, so I had an excellent view of what was happening up front; finally I stopped panicking and instead I started wondering how different navigating through the air is to finding your way around on the sea. Guernsey was wet and windy and as we walked across to the terminal it occurred to me that our first day of training, tomorrow, was going to be a little exciting. Thankfully, the forecast from earlier in the week had changed somewhat, as it usually does, and the 30 knot winds had been replaced by much less worrying 16 knot winds. Nevertheless, it was still going to make us think about how we approached our close quarters work. After lots of cheery ‘hellos’ and swift, manly hugs, we headed off to the boat to dump my stuff and then on to dinner. 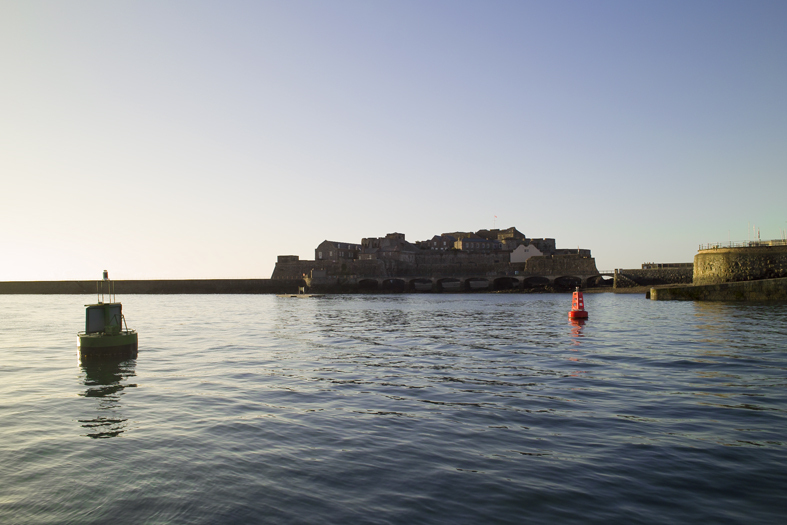 There are hosts of lovely restaurants surrounding the harbours in Guernsey. If you ever choose to cross the Channel, and I would heartily recommend you do, this island is definitely worth a visit. For all sorts of reasons of course but mostly, in my opinion, for the food. The fish dishes are magnificent and the French influence is plain to see. The next morning the wind had changed direction and was now going to be completely in the wrong direction. ‘Wind over tide, lunch over the side’, one of my students said to me once. It was definitely going to be lumpy out there and St Malo had become a non-starter. So, plan B came into effect and as soon as we’d had breakfast and completed all our checks we set off for a bumpy ride around Herm. Drawing on some expert local knowledge – Ross has been navigating around these islands ever since he was a young lad – we wove our way through some narrow channels, with some ever so jagged looking rocks sticking up on either side of us. Actually, the channels were really well marked and once we’d made it through it wasn’t such a drama after all. Out of the wind it was a superb day. There were barely any clouds in the sky and in places it was quite calm. 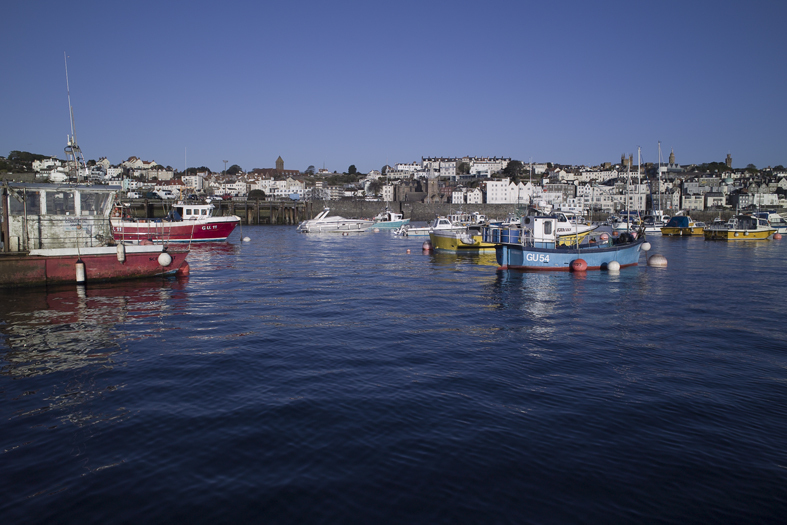 So we decided to head for a sheltered bay to anchor off for a spot of lunch – on the east coast of Guernsey, just below St Peter Port, is a lovely spot called Fermain Bay. There were plenty of transits to line up on but the wind was so light in the bay, as it was supremely sheltered from the North Westerly wind, that we needn’t have worried about the anchor dragging. We were soon anchored up and munching our way through a light lunch; must save space for dinner! Incidentally, if you do find yourself in a situation whereby you’ve set the anchor but it then starts to drag, before you go about pulling it up and starting again, try letting another ten metres of chain out. Also remember, never anchor on a ‘Lee shore’. This is a shore which the wind is blowing on to. Clearly, letting out more anchor chain in a situation such as that would just put you closer to the shore and you would run the risk of grounding on the shoreline. After lunch we headed back to the marina. Being a very tidal area and the marina having a sill, we needed to get back into the marina before the tide level dropped too low. Once inside I thought it would be a good opportunity to practice some close quarters work. 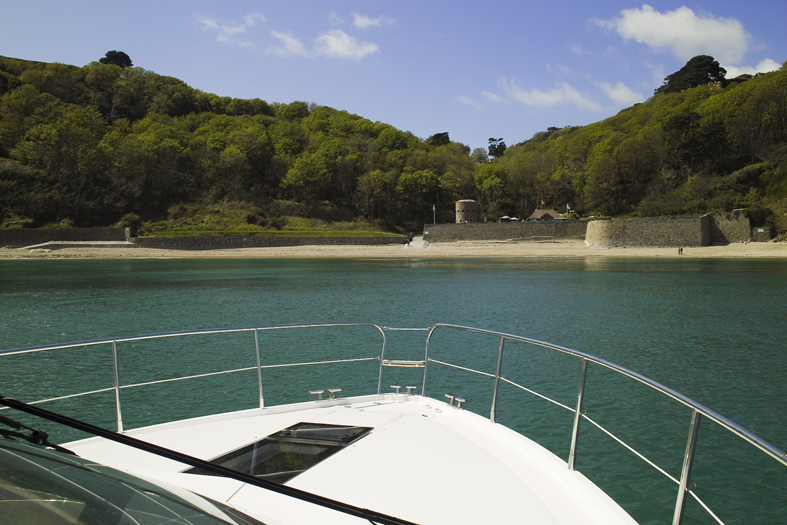 We created quite a stir, not only the mud at the bottom of the marina but also from some bemused onlookers, who’d obviously never seen a 42 foot, fly-bridge motor cruiser going sideways down a channel before – we meant to do that! Finally, we moored alongside the berth and set about planning our next great adventure. Two mugs of very welcome tea later, it had been decided that we should go to France for lunch – our destination was to be Dielette. The next morning it was completely calm and there wasn’t a cloud in the sky. Ross and I got up early to move the boat out of the marina before the tide dropped too far and put her on the waiting pontoon in the other harbour. Once we had all showered and dressed we set about getting the tender off the back so that we could go ashore and get some… breakfast! 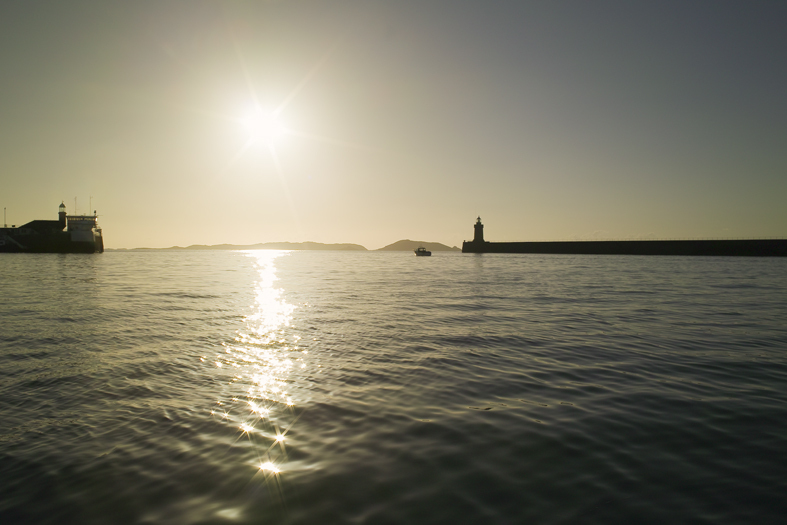 Sark is gorgeous from the water, it must be even better on land. 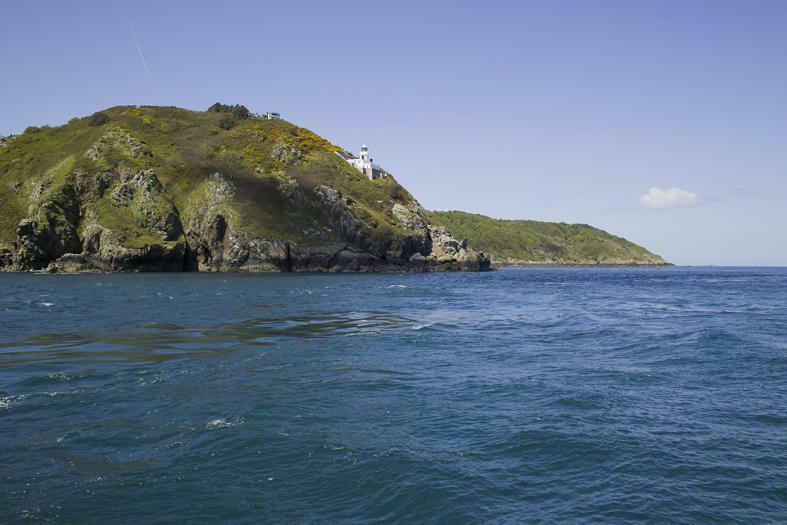 Did you know that there are no cars on Sark, just horses, carts and a couple of tractors? Look at the tide flowing through channel in front of the lighthouse in the shot below. This next picture shows the harbour in the middle of the shot, with the road winding its way up the hill – an energetic walk or a ride on the tractor drawn trailer; you decide! 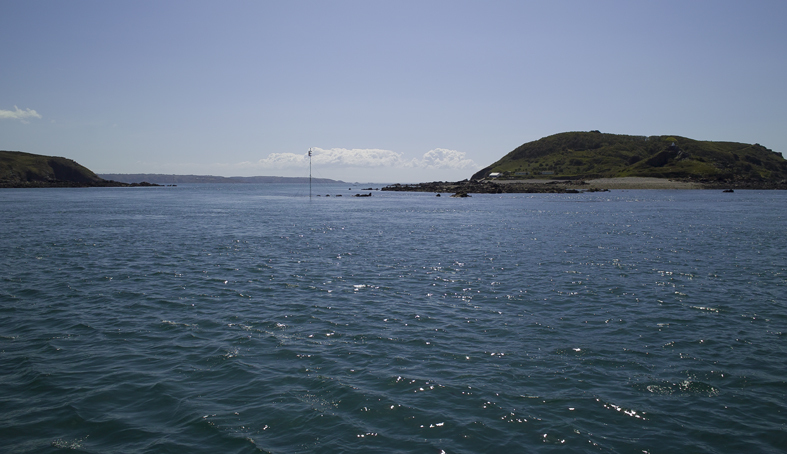 An hour and a half of perfectly flat sea later, Dielette harbour appeared in front of us and we headed in. I made certain we had all the relevant documents on board, as a good sea school captain should do, especially since I have been asked for every bit of paperwork imaginable on previous occasions but the harbour master was kindness exemplified! Not only did he waive the mooring charge – we were only staying for lunch – but he telephoned a local restaurant and booked us in. What a nice fellow. Even better, the lady who owned the restaurant looked after us personally and sang a delightful song under her breath as she served us. I’m certain it was delightful, even though my French is a little sparse, as she wore a lovely smile the whole time. Go to Dielette, it’s a brilliant place! Full from a sunny lunch in France, we jumped aboard and whizzed back to Guernsey. As we made our way back to the marina I reflected on the last couple of days. This is truly a magnificent way for friends and family to spend time relaxing together. 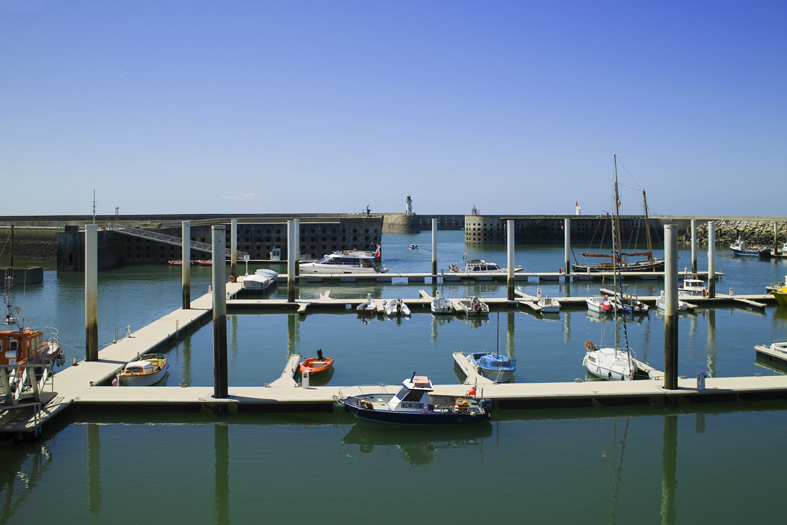 A spell of nice weather, an open sea, and a passage plan make up the ingredients for a smashing day out. Keep a look out for my next big adventure which will be from Lake Windermere in Cumbria – by for now shipmates!